Anthropologists said they have pieced together Leonardo da Vinci’s left index fingerprint — a discovery that could help provide information on such matters as the food the artist ate and whether his mother was of Arabic origin. The reconstruction of the fingerprint was the result of three years of research and could help attribute disputed paintings or manuscripts, said Luigi Capasso, an anthropologist and director of the Anthropology Research Institute at Chieti University in central Italy. “It adds the first touch of humanity. 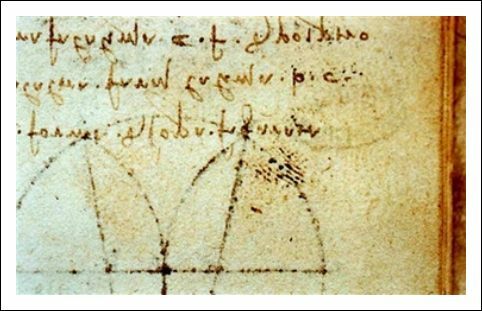 We knew how Leonardo saw the world and the future … but who was he? This biological information is about his being human, not being a genius,” Capasso said in a recent telephone interview. The research was based on a first core of photographs of about 200 fingerprints — most of them partial_ taken from about 52 papers handled by Leonardo in his life. A man is recovering after shooting himself with his own crossbow. Weapons collector Steve Samson, from Rochford, Essex, was cleaning the crossbow when the aluminium arrow speared seven inches into his body. The 2ft arrow narrowly escaped his vital organs. A four-year-old changed into his Power Ranger costume and attacked when his family were held up by an armed robber. Stevie Long sneaked out of the room while a robber was pointing a gun at his five-year-old sister Mary and mum Jennifer. Minutes later, he leapt back into the room dressed as a Mighty Morphin Power Ranger, reports the News and Observer. The robber and his accomplice, who was waiting outside the apartment, fled with credit cards, jewellery, and cash. “I scared the bad guys away,” Stevie said later at the apartment in Durham, North Carolina. Want to buy Hitler’s racing car? 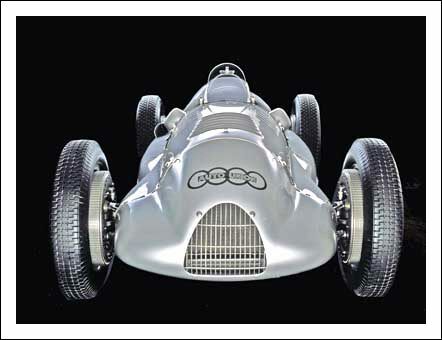 A racing car commissioned by Adolf Hitler is expected to become the most expensive car ever sold at auction. The 1939 Auto Union D-Type, thought to be one of only two in existence, was created by Ferdinand Porsche after a personal request from Hitler. The German dictator wanted the car as a propaganda tool to show off the technological superiority of the Third Reich. The car, one of the fastest of its time, has 485 horse-power and a maximum speed of 186mph and is going to be auctioned by Christie’s in February in Paris. Almost all the D-Types were destroyed during the Second World War but this one was taken to Russia for its technology to be studied. It was taken apart and the dissembled parts were discovered in the 1990s. The car has since been reassembled and is expected to reach a record price. The current world record for a car at auction is held by a 1931 Bugatti Type 41 Royale Sports Coupe – sold for £5.5 million by Christie’s in the late 1980s. December 1, 2006 Posted by oldstersview | Uncategorized	| Comments Off on Want to buy Hitler’s racing car?